More from Santa Barbara, earlier this month. May is going by fast, isn’t it. April did too, and March, and don’t even talk about February. These are my 40s now and time waits for no man. January by comparison was slow and languid, as I was in my leisurely carefree 30s. I’m only joking. So, that Day Of Sketching Stuff (“DOSS”? 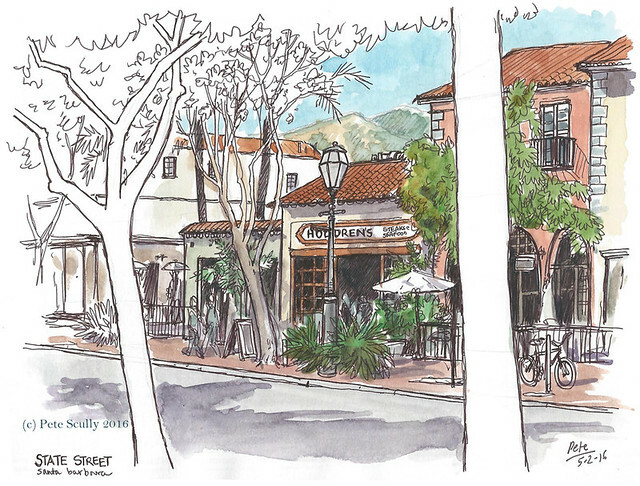 Hmmm) yielded more results, the sketch above, drawn from the window seat of the Santa Barbara Brewing Co, where I finished the day with a cold beer I can’t really remember much about, it was that unmemorable. These are my 40s etc. 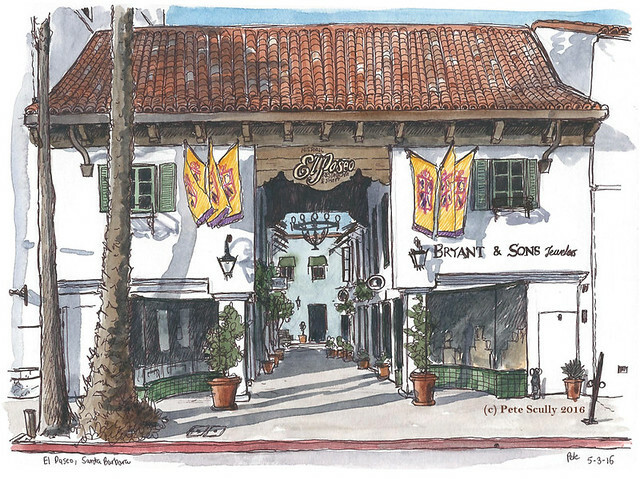 I just wanted a seat to look out at State Street and sketch that Santa Barbara daylight once more. My legs were so tired, and for some reason I quite inexplicably took an even longer way back to the hotel than usual. I discovered the short cut on the next day, it was called a “cab”. The next day, after a day of Conferencing, I went back up State Street to sketch some more before dinner. And a lovely dinner it was too; the previous night I had eaten with fellow adviser types at a seafood place on the pier, and while the company was great, I couldn’t finish the food, it was a bit much. Some sort of seafood medley. I decided I would eat something fancier the next night, and I found a little place called Le Petit Valentien, where (dining alone; I was the only other person in the restaurant, on a slow Tuesday evening) which made the most delicious food, and I had roast duck, followed by creme brulee. There was a mirror opposite so I didn’t feel too lonely. The staff were very friendly as well. That was my rest after sketching these two scenes, above and below. This is El Paseo, a historic passage just off of State Street. I stood on State sketching the entrance above while people wandered by. I walked through, past a couple of restaurants a little bit fancier than what I was really after, and as the light started fading I sketched this courtyard. That round building is funny isn’t it, it has a goatee. You don’t often see buildings with facial hair but this one thinks it’s the 90s and might be wearing a t-shirt with a serious sounding band on it. 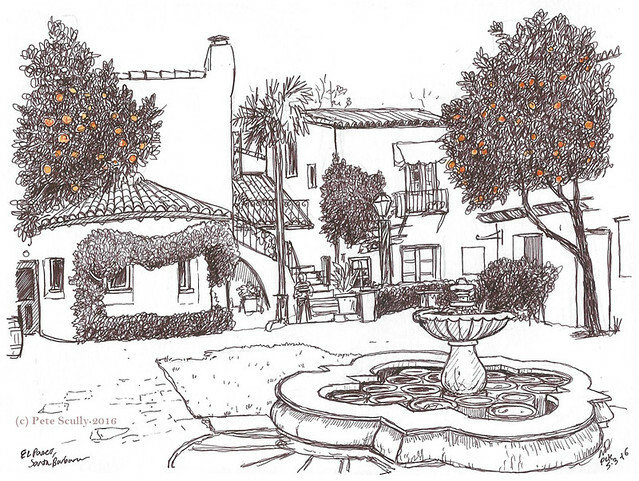 And that’s all for now folks, but more Santa Barbara sketches to come. I’d post them all in one go but I just can’t find the narrative that strings them all together. Besides where better to leave this post than on a house that has a massive goatee? Wonderful sketches and brings back memories!